For the last two decades of its 130-year history, 1309 Hay Street has been home to Aldo and Connie's Italian restaurant. Walking through the front door of this magnificent two-storey house and into the dining room, you're met with a very warm reception and treated to some fabulous, honest-to-goodness home cooking. 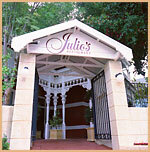 Little wonder then that Julio's has a huge following. Come for a light lunch and relax in the bright and airy dining room. Drop in for dinner and enjoy the intimate ambience. Stop by in winter and warm yourself by the beautiful original fireplaces with a hearty meal. Or saunter in during the summer months and dine alfresco in the delightful garden courtyard.